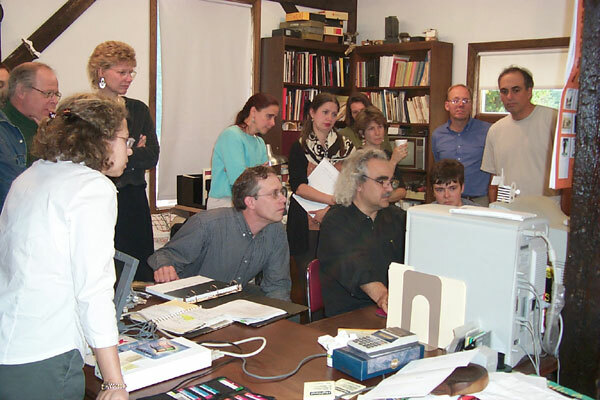 The Albumen Website was released to the Profession at the "Conservation of Contemporary Photographs" symposium held in Kent, CT Sept. 22-23, 2000, at José Orraca's Conservation Studio. Observing the roll-out by Paul Messier (off camera) and Tim Vitale (seated), were (l to r) Lee Ann Daffner (hidden), Tom Edmonson, Rachel Danzing, Debbie Hessis-Norris, Nora Kennedy, Gary Albright, Theressa Fairbanks, Diane Tafilowski (partially hidden), Kim Schenck, Marion Hunter, Chris Foster with Andrew Robb, Barbara Brown, Carol Turchan, Barbara Lemmon and José Orraca all off camera. Sylvie Penichon was behind the camera.